Hi Truthseekers. It's Tax Day. Time to pay Uncle for all the national services we enjoy. Like the never-ending terror wars. And the domestic surveillance programs that spy on innocent Americans. Our tax dollars are certainly not being spent (in any meaningful way) to support the social programs that used to define our nation, like education, health, and welfare. But there are more important fish to fry. Or rather, lack of fish, to be precise. Last week our family visited our favorite beach in the Florida panhandle, not too far form the former oyster capitol of the world -- Apalachicola. We love this beach. The locals call it "the forgotten coast" because it is still relatively primitive and unpolluted. There are no commercial franchises to be found, and no buildings over two stories high. And the greatest entertainment is fishing, and watching the dolphin play along the sand bar. So many dolphin. And skates and rays and jellyfish and starfish and coquina and sand dollars and conch and scallops and just about any marine animal you can conceive. But this time the oysters were imported from other waters and there was not a dolphin to be seen. Even the dark blotch of inky seaweed that dotted the line where the waves met the sand was missing. It was like one of those post-apocalyptic movies, like "On the Beach," or "The Day After." But this wasn't a movie. We were there, and the sea-life wasn't. There were a few birds -- not nearly as many as usual. We are accustomed to fending off the pelicans in the parking lots -- but not this time. Their numbers were noticeably reduced. And oh, how we missed the dolphin. These happy companions are usually the highlight of our trip. They seemed to follow us wherever we went -- walking the shoreline, kayaking along the sandbar, floating in the shallows. This time we didn't see our usual friends. So I called one of the island eco-tour companies that specializes in dolphin encounter boat trips for kids. The cheerful lady on the phone confirmed my worst suspicions: "we aren't offering the dolphin encounter trip right now -- would your daughter be interested in an air boat tour of the river? She will see lots of alligator!" Why no dolphin tour? I asked. "Oh, we aren't offering that now. We aren't sure why, but there just don't seem to be as many dolphin as last year. So we can't book the tour because we can't promise anything ..."
The beach was as beautiful as ever. The sunsets were spectacular. The waves soothed us to sleep each night with their perfect white-capped-white noise. The full moon was so bright we cast a shadow at midnight when we walked along the cool sands. There were no menacing jellyfish to dodge as we body-surfed the gentle waves. No pelican to peck at the wayward french fries we let slip from our greasy fingers. No ghost crabs to stage a fated attach on our little Rusty when we dug our nightly campfire. It was surreal. And not in a good way. And we couldn't help but think about all the corexant BP dumped into the gulf following the Deepwater Horizon disaster of 2010. 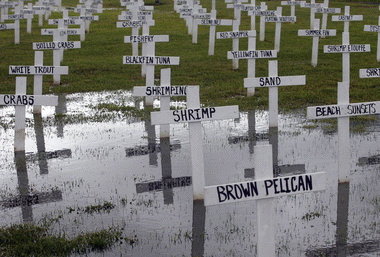 Almost 5 million barrels of oil were spewed into the gulf before the pipe was capped. And countless gallons of the chemical corexant were deliberately dumped to "mitigate" the oil. And to what end? There has been scarce news reporting in the last three years, but some environmental experts are not surprised at the seeming diminished marine life we witnessed last week. "No matter what BP and others are telling you, the oil is not gone. The report, published Tuesday by the National Wildlife Federation, looked at the health of 14 Gulf species, including bottlenose dolphins, blue crabs, coral, and multiple bird species and found that many of them are still struggling with the health effects of the spill. Scientists said on a press call Tuesday that though their report provides a good framework for the years after the spill, it was difficult to find adequate reports on many species' health because much of the research hasn't yet been published due to BP's ongoing trials. "'No matter what BP and others are telling you, the oil is not gone,' Doug Inkley, NWF senior scientist, said on the call. Oil continues to wash up on the Gulf's shores -- as recently as April 2, Florida Department of Environmental Protection officials found more than 350 tar balls on beaches in Escambia County, Florida. "Inkley said he isn't surprised that species continue to suffer as a result of the spill, given that 25 years after the Exxon Valdez oil spill, some parts of the ecosystem in Prince William Sound still haven't recovered. "1. Bottlenose dolphins: The report notes that between April 2010 and March 2014, 900 bottlenose dolphins have been found dead or stranded in the northern Gulf. Dolphins' health has also suffered since the spill, with dolphins that live in and around the oiled region showing signs of anemia and liver and lung disease, as well as an increased number of stillborns. But Inkley also said it was difficult to know exactly how many dolphins -- and any other animal -- had died as a result of the spill. "2. Atlantic bluefin tuna: The Gulf of Mexico is one of only two places where Atlantic bluefin breed, and the Deepwater Horizon disaster occurred during the species' breeding season. One study noted in the report found that a chemical in the oil that spilled can lead to irregular heartbeats in yellowfin and bluefin tuna, which can lead to heart attack and death for a species whose populations have already plunged in the last several decades due to overfishing. "3. Sea turtles: Like bottlenose dolphins, strandings for the five species of sea turtle that live in the Gulf have remained above normal in the four years after the spill. Each year, about 500 dead sea turtles have been found in the region affected by the spill, and in 2013, about three-quarters of those strandings were the critically endangered Kemp's ridley turtles, which spend their entire life cycle in the Gulf of Mexico. But it will probably take decades of monitoring to determine how the 2010 spill affected young turtles, due to how slowly they mature, said Pamela Plotkin, director of the Texas Sea Grant. "'For species like the loggerhead turtle that doesn't reach maturity for maybe 20 or 30 years, we may not see the impact of what occurred in 2010 until 30 years from now,' Plotkin said on the press call.